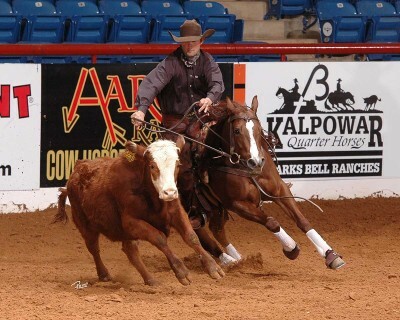 When Chris Dawson traded his nearly famous pink show shirt for a variety of colors, some may have thought the talented horseman’s luck would go with it. Dawson proved those people wrong when he piloted Shiney Nu Annie to the Aaron Ranch Cow Horse Classic Derby Open win on February 16, 2015. Sporting the modest black shirt he wore the night he and Shiney Nu Annie were named 2014 National Reined Cow Horse Association (NRCHA) Snaffle Bit Futurity Open Reserve Champions, Dawson piloted the 4-year-old mare to a 150 on the fence work only finals. That score combined with his preliminary composite of 437 (144 herd/ 149.5 rein / 143.5 cow) for a total 587, which bested the competition by a 3-point margin.